Just wanted to share some news. We found a beautiful cottage home to buy. We will be moving into Junk Chic Cottage III at the end of May. Our home here sold in two weeks and we have been scrambling to find another home for us. I was very picky about what I wanted in the next home. I wanted a home with charm and character and one level living. I wanted it in a great neighborhood with lots of charm. All the homes we were looking at went under contract within a day or two of them being listed. There has not been too much inventory out there and a lot of buyers. So it is certainly a seller's market. When houses would come on the market we had scheduled an appointment to look at the home and before we could get in the house went under contract!!!! That is how competitive it has been to find our next place. Here she is an all brick cottage in the heart of Arlington Heights, Il. She is tiny but oh so cute. I can see pulling some of the bushes and putting in roses and flower boxes under those cute windows. Terry is going to tear out the sidewalk that goes to the street and around the sides of the home and put in pavers. It will dress up and make this home just pop with curb appeal. Lots of charm to this brick cottage. The backyard has lots of mature trees along the back and lots of beautiful flower beds. I only have the pics from the listing but hope once we move in and get things planted I can show off this beautiful backyard. We will have to add a garage to the back of the house which there is plenty of space to do that. It is a must to have a garage in Illinois for the winter months and Terry needs a work space in the garage for all his tools. That is a priority on this new place. 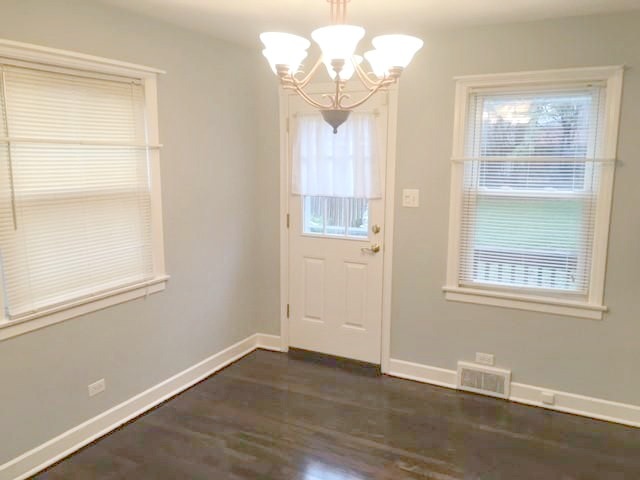 The home has charm with thick baseboards and freshly painted light blue gray walls throughout. We will add some beautiful crown molding to each room to give this pretty cottage more charm. Gorgeous hardwood floors through out that were just refinished. 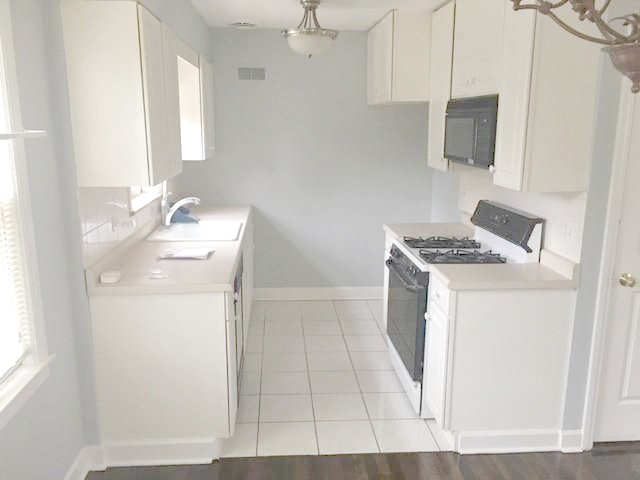 The kitchen needs new counter tops and sink and all new appliances but the cabinets are fairly new and white!!! 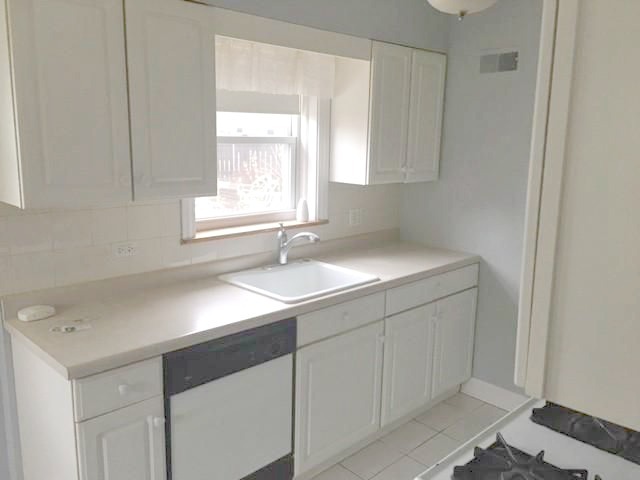 Yeah for white cabinets. The kitchen is very small so the room right next to the kitchen is a dining room and we are going to expand out the kitchen to include this area. I cannot wait to start those changes to show you in a future post. This is the dining room right off the kitchen so this will become part of the new kitchen area. These pics are not the greatest since they are off the MLS. I will have better before pics when we begin to work on the kitchen. 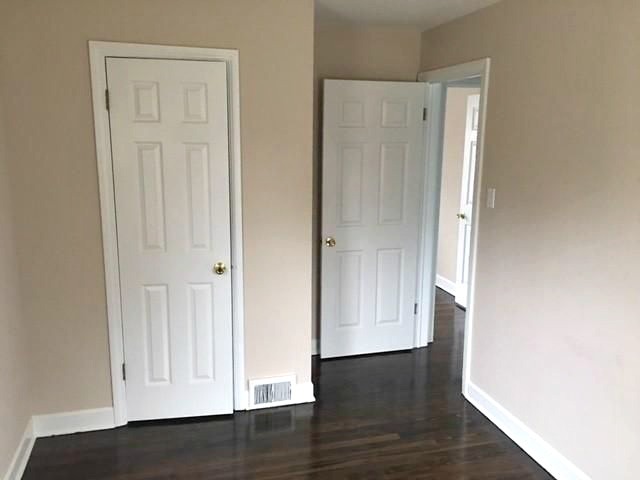 There are only two bedrooms on the first floor and they are small. We will make a master bedroom and maybe an office/guest room out of the other. 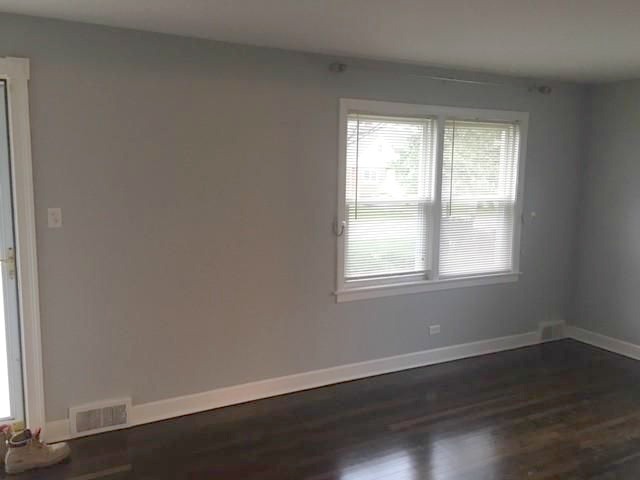 I will be painting these two rooms to a lighter white/gray color from the light tan they are now. Just will match my style better. The home is small but it is just Terry and I and Cooper so it will work nicely. It has a full partially finished basement that will be made into a family room and laundry room and also an office area for Terry. We will be putting up walls and doing some electrical and plumbing things down there to finish that into workable livable space. 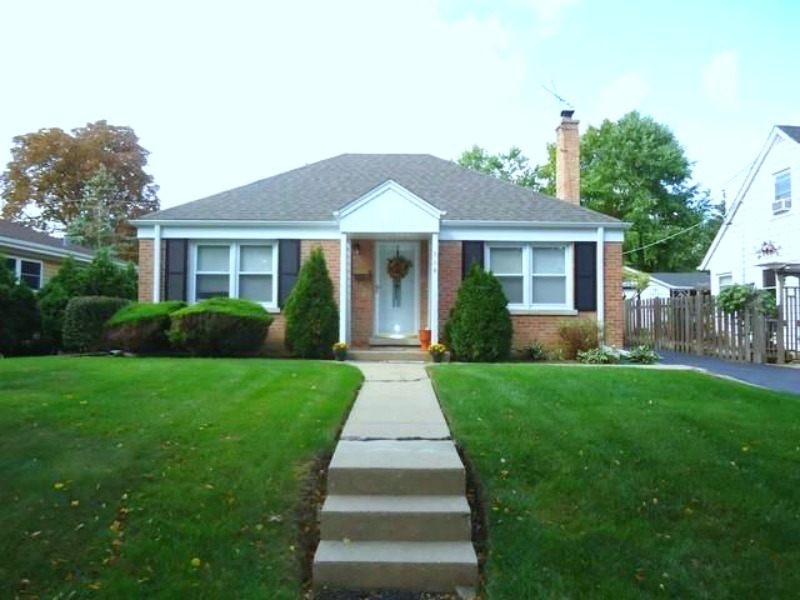 We are excited to have been able to purchase this home. It has the cottage feel I love in a home. I know I will have fun getting this little place made into a home for us. My mom is doing so much better and is going to be able to live back in senior living once again up by us. I have been working hard on getting her into senior living up near where we will be living. My mom is excited to have some of her independence back and will be happy to be living with other seniors and making new friends. It was hard for her to leave all her sweet friends in Florida. Hoping she will make new friends and be happy living independently again. This was a good move with my mom's health the way it is. If she needs help we will be near to help her. She is up near all of her family again and will be able to see us more. I know she will miss the weather of Florida but she will be gaining her family. Thanks for all the prayers and good wishes for us. I have to say I have been so stressed with moving my mom when she was pretty sick and being by her while she was nursed back to health. On top of this selling and trying to find another home!!! Yikes!!! Now I hope I can get my mom settled in a place soon and then us settled into a new home too! So much still to do ahead for me. I really hope to be back to blogging again soon when we get settled into the new cottage. It will be fun to share the changes to the new cottage with all of you. Have a wonderful new week ahead. Please know that I do not always comment on your blogs with how much I have going on in my life but I do try to visit and see what you are up too. Oh I am so thrilled for you with the beautiful new home you found. It is going to be perfect and so much potential for your gorgeous style. Can't wait to follow along as you make it yours. Have a very Blessed Easter. That's wonderful news about your Mom, Kris. I'm sure you will feel much better to have her nearby. And I'm so excited about your new cottage. I can just imagine how cute it's going to be. Good luck with everything and Happy Easter! Congrats Kris on the cute new home!! Can't wait to follow along as you make it your new home. So glad to hear you mom is doing well. Happy Easter! Oh, Kris! Aren't you just heaving a huge sigh of relief now that all with which you've been dealing has resolution!? So thrilled to hear your mama is doing better, and I can already see you settled into JCCIII. It looks perfect. Best wishes with the move; I'll look forward to hearing more. I'm so glad for you that you've been able to find a new home for your Little family. The cottage looks very charming and it'll be funny to follow the work you'll do with it. Have a great Easter Day. Kris, I'm so happy everything is moving in the right direction for you. I'm glad to hear that your mother is doing better and will be living near your new cottage. And your cottage is SO charming! I can't wait to see you do your magic! It's amazing that you've already got it all planned out in your head. I need to switch to your brand of coffee. hehe I wish you and your family a wonderful Easter Day!! Congrats on the new home!! It is so sweet. I know you will make it perfect for the two of you. Glad to hear your Mom is doing better as well. Happy Easter. Congrats on your new home! I know you will make it as beautiful as your last. Kris, I'm so happy for you, your husband and your Mom. Everything is working out just right for you. I love your new cottage and I can just imagine how beautiful it will be after you have added your magic touch. Kris, your new cottage will be wonderful after you put your touch on it. So happy that your Mom will be able to live near you. I know my Mom had to move from her family and friends in Texas but lives next door to me and is happy I am able to care for her. Can't wait to watch the changes to the new home. What wonderful news! It's adorable...charming...perfect for you both. I can't wait to see the changes you make. Hope you have a blessed Easter Sunday. Congrats on finding your new cottage! It is already charming and it will be fun to follow along as you personalize it. That is just the greatest news about your mom's recovery. I am so happy to see everything falling into place for you, Kris. Happy Easter! I am so happy to hear the good news. Congratulations on the new cottage. And my heart is singing with the good news about your mom. Looking forward to all the upcoming posts as you make your beautiful stamp on your home. Wonderful news! I am so happy you were able to find a new cottage.... and it is sooooo charming! I'm glad to hear your mom will be able to live on her own again too. So happy for you and your sweet new cottage! So many ideas you already have! I'm glad your mom is better and will be nearby. You have been through so much. I'm so happy it is all finally coming together. Happy Easter! Oh, Kris- that is beyond wonderful!!!!! I amn so so happy for you - what a CUTE place!! I would love to have something smaller - it's just so much cosier and sweet and charming. CONGRATS on both the sale and the buy- whoo hoo! HAppy blessed Easter. Taking a break to finish a cuppa before "hopping" back on the bunny trail feast prep. I knew you would land in a great place and it will be fun to follow you and Terry along as you change the house to Junk Chic Cottage. Congratulations Kris!! God is so good! I am so thrilled for you all that you found this darling cottage and I know it won't be any time until it is made all "you". Again, congratulations. It's very cute! I actually like the appliances the kitchen already has. And love the hardwood floors. Glad your mom is getting settled and that you have found your new-to-you home! God has it all under control and gives us the desires of our hearts! Congrat's on the new cottage! We all know that you & Terry will make it lovely! Happy that your mom is closer and doing well. Easter Blessings! Take care of yourself! What great news all the around today. So glad you found you new home and your mom is doing better. I am so happy for you, Kris! And I love this sweet brick cottage. 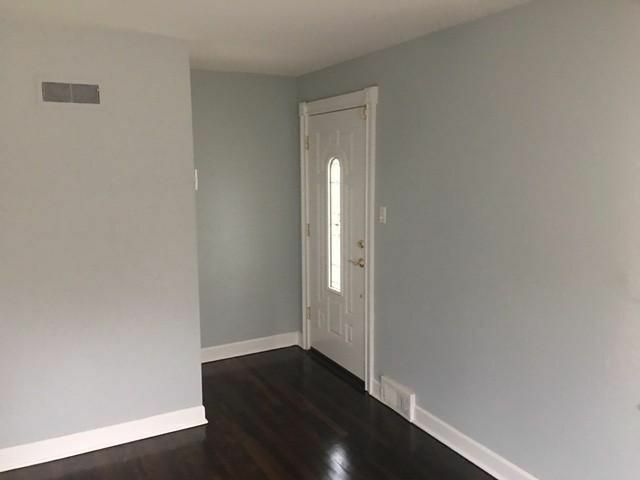 The listing pics already make it look so pretty to start with and I can't even begin to imagine how lovely it will look once you two magic makers have time to unleash your creativity on it. And that lawn already looks so lush and green. What a busy and complicated life you've led recently, certainly not easy in the least bit. I wish I could waft you away to a resort for a week's R & R. Lacking that, I pray that the rest will go smoothly and that your mother will quickly find friendly faces, and that all will get done for that May move (just in time for some spring planting!). Cute house....Husband and I used to live in Arlington Heights at Rand and Heintz behind Barnaby's, not even sure Barnaby's is there anymore. Our house isn't, I think now there are apartment buildings there. But that was back in '73-76 then we moved up to Ladysmith WI...20 acres, we had a little mini farm....I loved it there. But....Arlington Heights is a nice town...you will like it and I know enjoy fixing your cottage up....have fun!! What a great new cottage, Kris! I'm really so happy for you all. Things are definitely heading on the right direction for you guys. You've been through hell and it's time for a little taste of heaven. Happy Easter. Oh wow! This home was meant for you dear, it's so adorable and I see your future settled in with your own yard and all the changes this cottage will take on. I love the all brick and my mind is ticking dear...you could look for antique European gutter hoppers that will add to the wonderful charm of your new N0. 3 Junk Chic Cottage. This cottage is going to get your signature stamp on it and some. I can not wait to see you all moved in and all the charm you add to this place. You must invite your selling agent back for a little sweet cottage tour I am sure she will love what you have done to it. See you soon Kris, thank you for your beautiful visit and comment, and a hug congratulations on your "Home Sweet Junk Chic Cottage"
YAY, I'm so very happy and excited for you guys. your new cottage is adorable! so many good things ahead. Hugs and blessings, Kris, can't wait to see what you'll do with this great place! It sounds like things are turning around for you and Terry! So happy your found your charming new home...she is a cutie and in no time she'll have your look and style only you can bring...Congrats! I can't wait to see all your changes- maybe it will inspire me. Oh! I'm so happy and thrilled.. you bought new house, your mom is doing well.. everything is fine..
Hope you have a Happy Easter.. Big hug.. I'm so thrilled for you and Terry. Everything is now going your way! It's good to hear that your mom will have her own place and be able to have her independence. I can't wait to see what you have in store for JCC3- I know your head is just swimming with wonderful ideas. These are such wonderful news, Kris! Congratulations on your lovely new cottage! I'm very happy for both of you. :) It's good to hear that your mom is doing so much better and is able to move as well. This year seems to be a good one for you even though it keeps you quite busy. THIS IS JUST WHAT YOU WANTED! 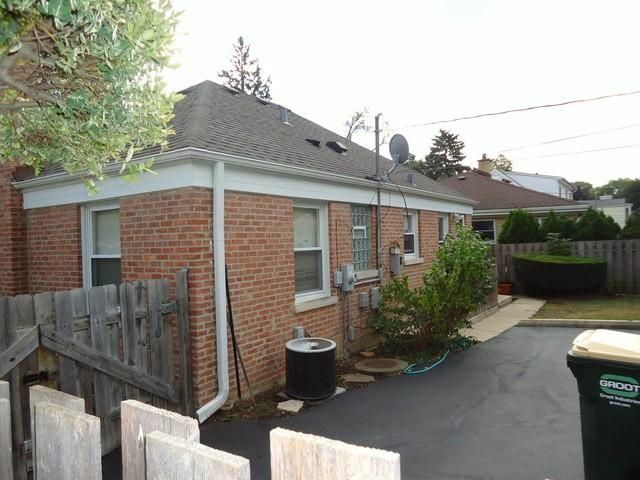 A smaller place, an older home with that charm, and we had discussed BRICK! Way to go, you guys! See? It happened. I knew it would. I can't wait to see your transformation! Are you going to paint the brick WHITE????? This is so exciting! A new home for you and a place for your Mom to live independently and meet new people, making new friends. I look forward to seeing what all you do to make this sweet little place your 'cottage #3'. Well you certainly have been a busy one! Congratulations on finding your new home and it sounds like this home meets your check list! It's nicely updated and looks ready to move in! Having a basement adds a lot more living space. So happy for you both! Good to know your mom is doing so well! Along with your throngs of blogging friends (those who blog and those who lurk and occasionally comment) I am thrilled that you've found your new cottage. And a cute little place it is. We will all be waiting with bated breath to see the transformation into Junk Chic Cottage III. And the news of your mother's recovery to good health is also a blessing. Sending you energy, determination and the joy of creating yet another masterpiece! I think she is perfect! She has good bones and just looks like home! Can't wait to see more! Congratulations on finding your new home! It is very similar to my tiny house so I am excited to see your design work and perhaps apply it to mine!! It will be easier to have your mom nearby and I'm sure she will quickly find new friends. I'm sure you and your husband will have fun with this new adventure! So thankful that everything is falling into place for you, Kris! God is working it all out. You amaze me with your energy! Your new place is adorable! So happy you found your new home! I can't wait to see what you do with it! I know it will be great! YIPPEE!! Cute, cute, cute. Can't wait to see your touches. Will you be leaving the brick or do a whit wash on the brick? So thankful that life has made that worrisome turn and you are now embracing the joy of a new home and your Mom is back to her lifestyle. I love book series that go into trilogy's and u can sink ur teeth into. I'm excited in anticipation to read the upcoming Trilogy of JCC...what a ride it will be! Oh Kris, I love love your new cottage! It is so cozy and beautiful and it has so much character. I can just see in the future how beautiful you and Terry will make her. Yeah, one thing to cross off your list. I'm so glad that your Mom is settled and doing well. Congratulations. I am so very excited for you Kris! The house looks charming and I know you all will have it all done up to fit your style in no time! I can't wait to follow along. It's so good to hear your mom is doing so much better and will be settled soon too. Great news all around indeed! This is great news. The cottage has lots of potential and you'll make it yours in no time. I'm glad to read things are going to turn well for your mother as well. Yay! I'm so happy for you. I'm excited to watch you work your magic on your new cottage! You have so many projects on your to do list I think you're going to have lot same of blog material for quite a while ;). Glad your mom is settled and doing better. I'm sure that gives you a lot more piece of mind. Oh, I love it! Congrats to you and hubby....Here is wishing you the BEST of wishes for you Mother and the new place! Yea! Congrats to you and Terry she looks charming! I just know you will work your magic on it and be the envy of the neighborhood. I'm so excited for you Kris and can't wait to see how you add all your chippy charm to this sweet cottage!!! This cottage is adorable with so much potential for all your white/neutral magic! Cannot wait to see all that you do to it! I'm glad everything is settling down. You sound excited and I'm very happy for you! Best wishes in your new home! Congrats on finding your new home! I love the plans you have for it. I don't know how you dealt with selling and moving while also dealing with your moms situation! That's a lot of stress. Sounds like things will finally be settling down now for you. Congrats! I can't wait to see all your changes! Blessings! Congratulations on your new cottage. What fun it will be to make it yours. I will look forward to your progress. I am so happy your mom is doing well, and able to be up north near you. I have thought about her so much, wishing I had been closer to where she lived in Florida. I'm so, so happy for you and Terry! This a the perfect home. You aren't quite far from your original home where I visited you with Emily. You are going to work your magic and I so look forward to following along. Big hugs to you, and sending prayers that your mother continues to do well. Yes, it looks like it is packed with charm! Adorable looking from the outside. How exciting! So glad you found your new cottage and super happy for you in having your mother close by! I am praying for your mom. I bet she enjoys seeing her great grand babies. Love it! Congratulations on selling your house so fast. Yeah houses are selling fast around here too. I wish we were ready to put ours on the market. But we have to wait until next winter. My daughter will be graduating early and hopefully we will sell quickly too. It's darling. Yeah for white cabinets. I cannot wait to see what you do with this cute house. I'm thrilled about your mom. Congrats on finding your new special place!! I am looking forward to watching your transformation.